Hasp and Staples can be fitted to allow a padlock to secure the door correctly. All of our hasps have concealed screws and pins that prevent them from being tempered with or removed. 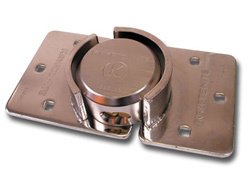 It is important to remember that Discus Padlocks are especially suited since the hasp covers the only area in which the shackle is exposed. 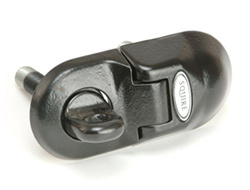 This is also the case with closed shackle padlocks when used in conjunction with the Vertical Pin and Granit type hasps. 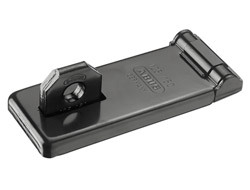 Probably the finest locking bolt on the market is the ABUS 300/120 with a hardened steel bolt, hidden screws and corrosion protected with a nickel finish. 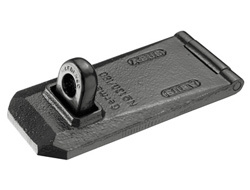 A locking bolt with built in 4 digit resettable combination ideal for doors, sheds, gates, lock-up boxes and more. Includes all security screws require to fit. 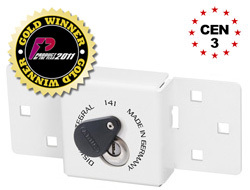 A low security hasp with an integrated lock for convenience. Each unit comes complete with fixings and is finished with a protective chrome plating. 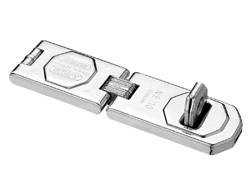 A standard yet high quality hasp and staple for basic security available in 3 sizes. 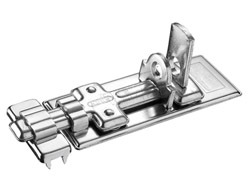 For its price it is still made from solid steel, contains concealed hinge pins and includes all fixings necessary. Fully weatherproof and specially designed for use with discus padlocks in such a way that the shackle is protected from unlocking tools, saw and force attacks. 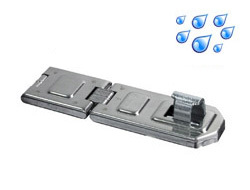 Note that this product is designed for doors which close flush without a large gap. 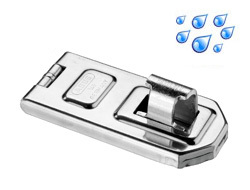 This is the same as our fully weatherproof standard hasp but includes an extra joint to enable it to be secured at right angles and opened beyond 90 degrees. Specially designed for use with discus padlocks in such a way that the shackle is protected from unlocking tools, saw and force attacks. 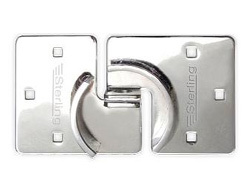 The horizontal pin allows the hasp to be used by any traditionally shaped padlock but also makes it a popular choice for installing the hasp itself vertically (pointing up or downwards) at the top of a door or closing lid. 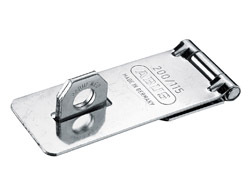 This hasp and staple is designed for use with standard padlocks, especially closed-shackle types. 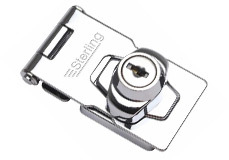 The vertical staple will allow a closed shackle padlock to sit in it's normal orientation. Protect your vehicle with the combination of the Kryptonite Shackle-less Padlock and the Hasp. 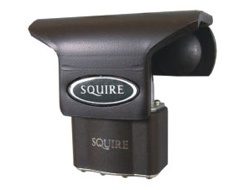 It is specifically designed for vans to give additional protection to the standard door lock. It is generally seen as a more high quality version of similar models on the market. 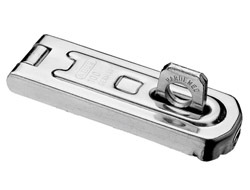 This is a high security hasp and staple designed specifically to work with the round padlock we sell that has no shackle. 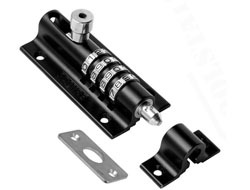 The two combined together give outstanding security leaving no exposed parts to attack!